Trump Blasts "Anyone Trading With Iran Will Not Be Trading With The U.S."
At one minute after midnight, the first round of renewed U.S. sanctions on Iran took effect, and in one of his earliest tweets since the presidential campaign, at 5:30am EDT, a sleepless Trump blasted out the "official" US position on countries that ignore his just imposed sanctions: "The Iran sanctions have officially been cast. These are the most biting sanctions ever imposed, and in November they ratchet up to yet another level" Trump tweeted. In a warning to China, India, Russia, Turkey and many other nations which have said they will defy Trump's sanctions and continue to import Iran oil, Trump warned that "Anyone doing business with Iran will NOT be doing business with the United States." Then, pulling a page out of a John Lennon album, Trump explained "I am asking for WORLD PEACE, nothing less!" As a reminder, on Tuesday, following an executive order signed by Trump, the U.S. imposed new restrictions intended to stop the purchase of dollar banknotes by Iran, prevent the government from trading gold and other precious metals and block the nation from selling or acquiring various industrial metals. The measures, which took effect at midnight in Washington, also targeted the auto industry and banned imports of Persian carpets and pistachios to the U.S.
Rouhani also scoffed that despite his offer for talks, Trump “is someone who, without any negotiation, has withdrawn from all of his international commitments,” from trade accords to the Paris climate agreement. 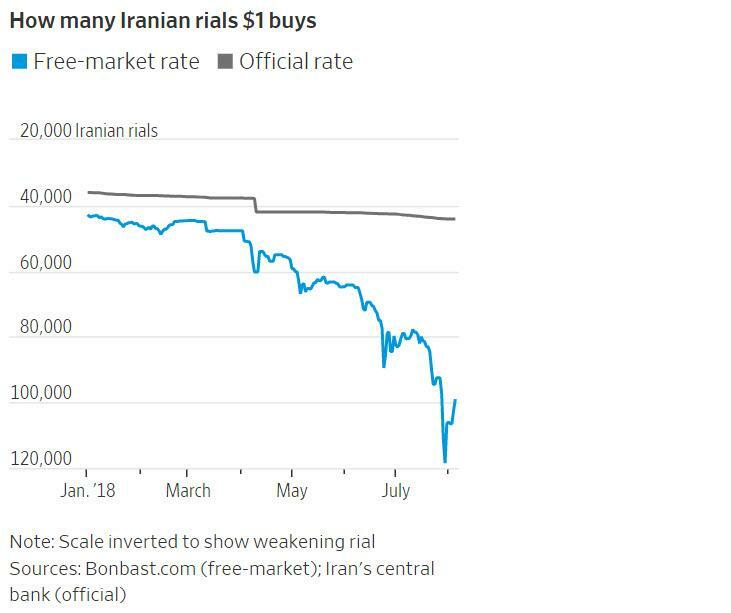 Meanwhile, in an attempt to halt its sharp economic deterioration, Iran’s central bank scrapped most currency controls introduced this year on the eve of the U.S. move, in a bid to halt a plunge in the rial that has stirred protests against the government. As Bloomberg reports, under the measures, Iran's central bank will let the market determine the rate of foreign-exchange transactions except the imports of essential goods and drugs, Governor Abdolnaser Hemmati told state television Sunday night. Licensed currency houses whose trading had been halted will be allowed to resume operations from Tuesday. But the policies backfired, with the rial weakening from 40,000 at the start of the year, to more than 100,000 to the dollar on the black market this month. That will come as good news to Trump, whose stated goal is to get the Iranian regime to stop meddling in countries from Syria to Yemen, halt its ballistic missile program and commit to stricter limits on its nuclear program, but the real intention, of course, is to overthrow the government, despite denials from the administration on the latter. Now the question turns to China - which has said repeatedly it will maintain trade ties with Iran - and how Trump will justify continuing to trade with Beijing under such conditions, and whether such defiance will prompt Trump to further escalate his trade war with the world's second biggest economy.